Shopping for a new bra? It's almost as big of a pain, if not worse, than shopping for jeans. Susan Bernard, 60, hadn't had a bra fitting in at least 27 years. But that all changed when she visited bra-fitting expert and coach Kimmay Caldwell — and the results weren't what she expected. Prior to her fitting, Bernard wore a size 34C. But according to Caldwell's measurements, a 32DD was actually a better fit. Caldwell explained that women often underestimate their cup size and shared some tips and tricks for choosing a bra that fits. 1. Make sure the bra is snug on the loosest hook. Over time the bra will stretch out, Caldwell explained. Making sure it's snug even on the loosest hook means it will last longer, because you'll be able to switch to the other hooks as time goes on and the band stretches. 2. Cups should be flush with your bust. To make sure there aren't any unwanted gaps or spillage, the entire breast should be inside the cup, Caldwell said. This also helps with support. 3. The band should should be parallel to the ground. It should also line up evenly from front to back. An easy check is to put one finger in between the two cups and the other on the clasp and make sure they feel even. The band is responsible for 90 percent of your bra's support, according to Caldwell, so it's important to make sure it fits properly. 4. The bra should stay put even if the straps move a bit. Straps should be able to shift up to 1 inch on either side without disrupting the fit of the bra. Not ready for an in-store fitting? People can even measure themselves right at home. If Bernard's bra fitting has inspired you try out a new one, here are Caldwell's picks. "I chose the Le Mystere Transformative Tisha for Susan because of its smooth, round shape and fuller coverage," Caldwell said. "Plus, it also helps even out breasts if one is slightly larger than the other — like most people! Just be sure to fit your bra cups to the fuller bust and leave a little room in the smaller cup rather than fit to the smaller breast and spill out of the cup of the fuller breast." "(The On Gossamer bra is) ultralightweight and easy to wear as a daily bra, with just a little bump padding for a little extra fullness," Caldwell said. 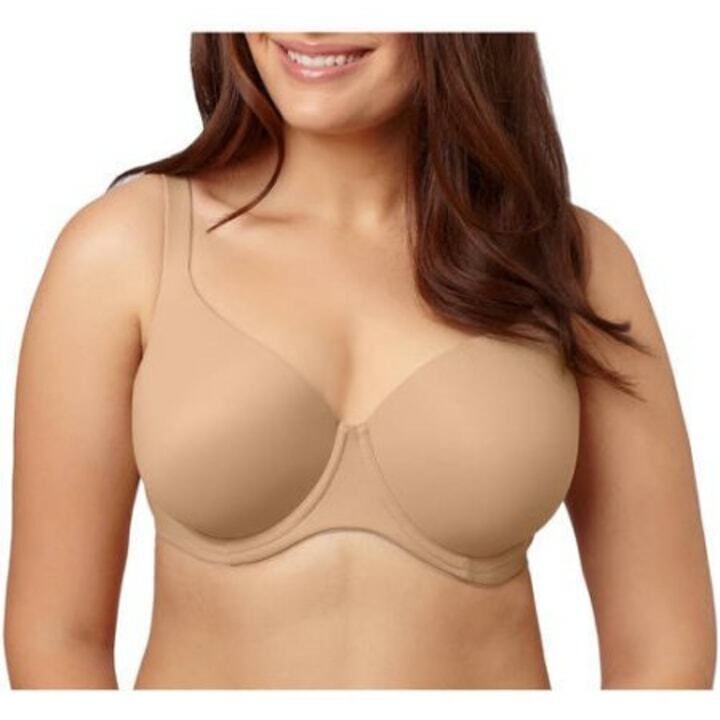 "The DreamFit Back Smoothing T-Shirt bra is a supportive and very economical option for plus-size or curvy women. Plus, the wide back is a great way to achieve as smooth a look in the back as the front," she said. "The molded cups provide great shape, and smart features like silicone strips, and study side supports," Caldwell said. "Susan needed a bra that would work just as hard if she was at brunch or dancing it out at a wedding reception. This bra is ready for both." "Other great strapless bras include DreamFit's Convertible Plus Size Strapless Bra, which is really amazing for fuller figures at a really affordable price," she said. "If you need a seamless look, try the Felina Hint of Skin Contour Strapless Bra," Caldwell said. "Unlike most sports bras, this one has an underwire and molded cups for a really defined and lifted shape," she said. "I also love that the straps are adjustable with hooks instead of a slider, and can even be converted to crisscross, so you never have to worry about them slipping." "Other great sports bra options include wire-free styles with ultrasupportive designs like the Royce Impact Free High Neck Sports Bra, which is super supportive for a really wide range of sizes," Caldwell said. She also likes the Shock Absorber Active Zipped sports bra, "which zips up the front for ease of putting it on and taking it off." "Another popular underwire option for D cups and up is the Panache Ultimate High Impact Sports Bra, which is super support for full busts!" Caldwell added. Now the only thing to do is toss out those bras that have been sitting in the lingerie drawer for years, and get shopping!